They couldn’t quite grasp why this country appealed to me so much. As a solo female traveller it’s not really the response you want to hear, but I wasn’t remotely deterred. So, off I went with my backpack, fresh-faced and ready for the adventure! Now that I am home and drowning my sorrows of being back, I can say with complete conviction that Colombia has it all – diverse cultural cities, stunning coastlines, adventure sports, trekking, and enough nature and wildlife for bamboo branches to be growing from your ears. In this post, I’ll only scratch the surface of why this beautifully-crazy country has everything you could want as a traveller. Love them or hate them, cities are on every traveller’s destination list; but as far as cities go, you’re going to fall in love with one of Colombia’s. Bogota, with a population of over 9 million people, has a gritty charm with street art dotted all over the city. As a backpacker you’ll most likely be hanging around the area of La Candelaria where most of the hostels are located. I’d recommend walking around the cute little cobbled streets to soak up the artsy atmosphere of students and backpackers alike. There are so many activities to do around the city: Bogota Bike tours, Bogota Graffiti tour, take the cable car to Monserrate (or if you’re feeling energetic climb it! ), visit an abundance of museums, and enjoy a lively art scene. Then you’ve got the beautiful city of Cartagena on the Caribbean coast. It was the most touristic place that I visited in Colombia, but it is clear to see why. The colourful old town is beautifully preserved and with my strange obsession with doors I wandered the streets photographing them and everything else in sight. Be warned, the city is like a furnace during the day, so venturing out of your cool air-conditioned room is best done in the morning or later on in the afternoon. From late afternoon, Plaza de Trinidad in Getsemani is the place to be. Perfect spot for some people watching or you can watch the local kids play football and wonder how on earth they’re running around barefoot on concrete. Those kids have mad skills. Then as the night creeps in, groups of locals and travellers will congregate for some drinking. Entertainment will come in the form of musicians and break dancers, and everyone will while away the night until early morning. My personal favourite would have to be Medellin. The city is beautifully nestled in a valley and stunning views can be seen when flying into the local airport. What struck me the most was how modern, organised, and cultured the city is. I’m utterly useless with public transport but the Metro is idiot-proof. It’s cheap and a great way to get around and see the city. Take a trip on the Metrocable, visit the thriving markets in the city centre, try your hand at paragliding, do the free walking tour, a Pablo Escobar tour, or sit and sip a perfectly-made coffee in one of the many delightful coffee shops in El Poblado. An Australian friend stayed in the city for around three months – he just couldn’t seem to leave. Once you’ve had enough of city life then Colombia’s stunning beaches are worth exploring. Colombia’s two coastlines offer a different experience altogether. On the Caribbean coast you’ve got Tayrona National Park where you can relax and take in the breath-taking scenery. It was like a scene out of Jurassic Park with its gigantic boulders, soaring palm trees and greeny-blue ocean. Spend a few nights in a hammock and enjoy paradise. Further along the coast, there is Palomino; a beautiful beach town, and even further along you’ve got Cabo de la Vela, which is the perfect spot for windsurfing. Near Cartagena you have Playa Blanca and a few islands with even more idyllic white sandy beaches. For a complete contrast and a different type of paradise a must see is the Pacific coast. If you have an adventurous streak then this will be top on your list. The only methods of transport to the coast are boat or plane. When I flew in on a ten-seater plane all I could see was dense green jungle and dark Blue Ocean. Pure paradise. Right then I knew I had made the right choice to spend a week here. I stayed at the Humpback Turtle Hostel, which was situated right on El Almejal beach. Here you can relax on the dark, almost black sandy beach, take a surf lesson, trek through the jungle, visit numerous waterfalls, or just lie in your hammock watching the sunset. And as far as sunsets go, they were pretty spectacular. What makes it more idyllic is that there isn’t any wifi and hardly any internet available so you stay disconnected. One of my favourite spots in Colombia. If you’d like to try out some adventure sports in Colombia then San Gil, in the region of Boyaca, is a must see on your route. One of the most exhilarating things I have ever done was white water rafting down the river Suarez. With Grade 4 and 5 rapids, it’s a crazy three hours downstream with a couple of breaks for refreshments and a chance to catch your breath before the next set of rapids. Never having done it before, it was a daunting experience, but our guide prepped us and eased us through the process (apart from when he fell out of the raft). Still feeling adventurous, I tried paragliding for the first time in Chicamocha Canyon, which had incredible views. For the even more adventurous types, you can ask your pilot to try out a few tricks before you land. Be warned, if you suffer from motion sickness like myself then you may unfortunately have to be sick into a plastic bag mid-air. Not one of my finest moments. Or, like my French and Swiss friends, you could try your paragliding experience completely naked. As far as I am aware they found the experience quite liberating and their Colombian pilots didn’t seem to mind…too much anyway. While you’re in San Gil you can also have a go at mountain biking, caving, abseiling down waterfalls, cliff jumping, and kayaking. There won’t be a dull moment in San Gil and they even have some culinary delights too – toasted fat bottomed ants. Yep. They are actually incredibly tasty and I would have to describe them as meaty, crunchy popcorn. Maybe, they’re not to everyone’s taste. If you don’t see yourself as the adventure sports kind of person but still fancy a bit of the outdoors, then Colombia also has some beautiful treks and walks. The Ciudad Perdida (The Lost City Trek), is a four/five day hike through the jungle to reach the ancient ruins of the city of Teyuna. We walked through beautiful unspoilt areas of the Sierra Nevada and met indigenous families along the way. It’s not as touristy as Machu Picchu as there is only one way to walk there and one way back (known to tourists that is) so you’re not fighting off other tourists to take that perfect photo. It’s a little challenging as the humidity makes everything sticky and icky, but there is a great sense of accomplishment when you reach the ruined site. I also trekked through the Valle de Cocora near Salento in the Zona Cafetera. 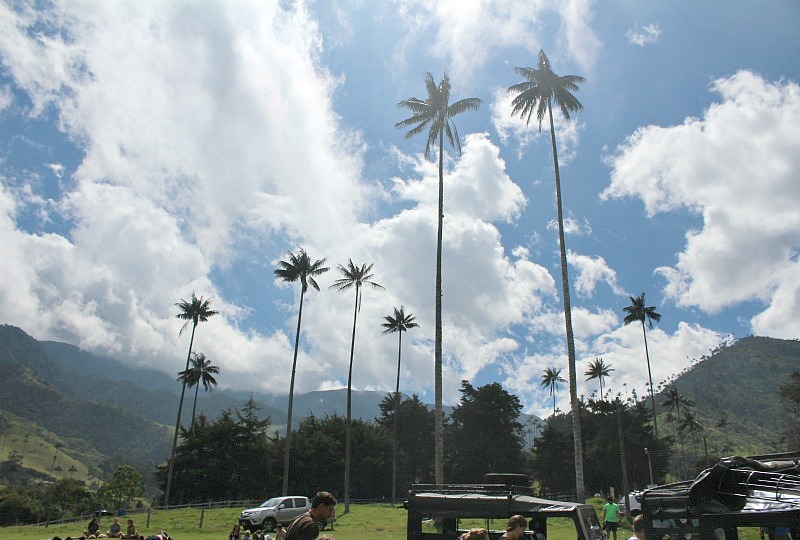 Valle de Cocora is home to the wax palm tree (the world’s largest palm tree), Colombia’s national tree. The beautiful five-six hour trek isn’t too difficult. There’s even a stop on the way where you can grab yourself a hot chocolate with cheese (weird combo I know) and watch the many humming birds zipping around. Once you reach the Valley there are incredibly picturesque views with the wax palm trees soaring in the air amongs the misty green hills. Other walks and hikes I managed to squeeze in were the eight-hour trek through PNN Los Nevados, a national park near the city of Manizales, the Camino Real, a 10 km hike from the quaint colonial town of Barichara to Guane, where the only passing traffic was one other group of tourists and a man with his herd of goats. The hike is mainly downhill along the edge of a beautiful canyon with some breath-taking views. In almost every region of Colombia you’ll find a hike or walk to entertain you and capture the diverse landscape. Colombia has so much to offer. In the very north of the country you can get a 4×4 to take you through the Guajira desert. You drive through miles of flat barren desert land to reach stunning deserted beaches, sand dunes, and Punta Gallinas – the most Northern tip of mainland South America. The sunsets are mesmerising and you won’t see another one like it in the country. The Pacific Coast comes close, though. Then in complete contrast, you can head to Zona Cafetera where green is the only colour to be seen. The region is mountainous with lush vegetation and is rich in one of my favourite things: coffee. You can’t go to this area without visiting a coffee farm. You’ll find out the history of coffee, the process of how coffee is made; from fruit to packaged bean, and normally there will be an endless supply of coffee for you to try. Colombia’s wildlife is something else. The country is the second most biodiverse country in the world, second to Brazil, which is around 7 times bigger. Out in the countryside you’ll encounter a wide range of plants and birds to feast your eyes on. On any guided trek or walk, all the different types of plants will be explained and every bird sound will be given a name. You’ll hear growler monkeys in the jungle in the Sierra Nevada, see Pelicans in the jungle of the Pacific Coast, and my favourite – humpback whales off the Pacific Coast. If you travel to Colombia between July and September then its whale watching season on the Pacific Coast. We went whale watching in a small boat and came across a family of humpback whales only 15 meters away from the boat with their tails swishing out of the ocean. Our group of ten were giddy with excitement and when the whales came up for air silence fell across us and we were truly amazed at the sight of these massive beautiful creatures. Even at the hostel, we spotted them from the shore – everyone ran out to the ocean front and stood in silence and amazement. It’s the little things. Above all of this, what makes Colombia that little bit more special is its people. They want you to have an amazing experience in their country and will go out of their way to help you: like the taxi driver who turned his taxi around, and ran out after me to tell me I was walking in the wrong direction; to the Colombian girl in Tayrona National Park who told us we should only pay X amount for the bus back to Santa Marta; to the hostel worker who drove me an hour to use the internet so I could tell my mum that ‘Yes, I was alive’ after a week of radio silence; to the random man in the coffee shop who told me my purse was sticking out of my pocket and to be careful; and to the hostel owner who let me borrow her jacket to go trekking as I didn’t have enough warm clothes with me. Colombians are one of the friendliest groups of people I have met. They want you to have an awesome time in their country and then you’ll probably do what I’m doing right now and that is harp on and on about how fantastic it is to travel there and that people need to get rid of these misconceptions of their beautiful country. Yes, you have to be careful and have your wits about you, but I do that when its late at night back home in Glasgow. Colombia is no different to anywhere else. So for me, Colombia has it all and I plan to go back in the very near future, but for now I’ll have to make do with starting all my stories with ‘When I was in Colombia…’. This is a guest post submitted by Cristín from Freckled Chronicles. Be sure to check out her blog and follow her Instagram account, too. Just noticed that you’re no longer in Colombia and was looking forward to meeting the blogger with all the good ideas about what to see in Medellin where we’ve decided to settle for a while. Great blog with lots of good ideas and insight, thank you for your work and observation. Where will your travels bring you next? Hi Deena and Ivan, thanks so much for getting in touch. That’s right, I’m in Australia at the moment. I do have some travel plans for later in the year… which I have alluded to here: http://www.sarepa.com/2016/02/03/whats-to-come-from-sarepa-in-2016/ But it’s definitely still in the planning phase. I’m so happy to hear you’re in Medellin! And thanks so much for your kind words, I really appreciate that. Keep in touch and I look forward to reading more about your time in Colombia. Perhaps we can catch up in Medellin sometime soon! Oye super interesante tu articulo y me encanta ver como los extranjeros se enamoran de Mi pais; solo quisiera hacerte una corrección, Sangil se encuentra ubicado dentro del departamento (o estado) de Santander. Lo corrijo porque veo que el articulo dice que es en Boyacá. Muchisimas gracias por la correccion Diana y por tu apoyo. Saludos!